Prime Minister Hun Sen ratcheted up his rhetoric against his opponents on Wednesday, hinting that he might deploy military force against any political party that attempts to wrest power away from the Cambodian strong man. 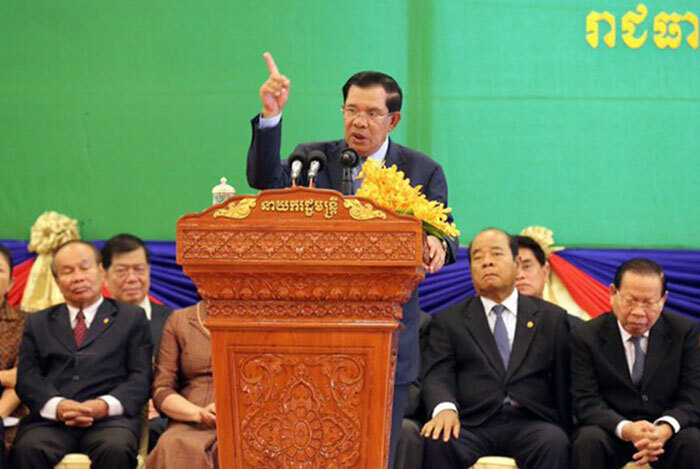 Hun Sen’s remarks during Wednesday’s commencement exercise at the National Institute of Education in Phnom Penh came as he and the ruling Cambodian People’s Party (CPP) are pushing new rules through parliament that would give the government vast power over political parties. National elections in Cambodia are scheduled for 2018, while local commune elections will be held in June of this year. If the changes are approved by the Cambodian Senate and signed by Cambodia's King Norodom Sihamoni, as expected, the amendments would also give the Cambodian Supreme Court the power to dissolve a party caught committing a list of vague offenses. The Interior Ministry would also be empowered to indefinitely suspend a party for similarly vague reasons. During his remarks, Hun Sen also took a swipe at Sam Rainsy, who was president of the opposition Cambodia National Rescue Party (CNRP) until he resigned in an effort to preserve the CNRP. The agreements ended the Cambodia-Vietnam War and established modern Cambodia after years of rule by the bloody Khmer Rouge and an occupation by Vietnam. CNRP spokesman Yim Sovann told RFA that the CNRP doesn’t want a war, but a peaceful transition of power. The latest salvo in the political battle comes as foreign governments, including those which helped war-torn Cambodia rebuild 20 years ago, decried the proposed party law changes. The U.S. Embassy said it was "deeply concerned" that the amendments were passed with little consultation or public debate. "Any government action to ban or restrict parties under the new amendments would constitute a significant setback for Cambodia's political development and would seriously call into question the legitimacy of the upcoming elections," the American mission said. It called on Hun Sen’s government to ensure that the elections this year and next "are free, open, and transparent, and that all political parties have the opportunity to compete on an equal basis." “Any government action to ban or restrict parties under the new amendments would constitute a significant setback for Cambodia’s political development and would seriously call into question the legitimacy of the upcoming elections,” the U.S. embassy said. Australia and the European Union also questioned the wisdom of the party law changes. “The Australian Government encourages the Cambodian Government to ensure credible and transparent elections by maintaining political space for all voices and views to be heard,” the embassy told RFA's Khmer service. Hun Sen chastised the foreign nations, particularly the United States, saying that Cambodian affairs should be left up to the Khmers. Hun Sen accused Washington of being hypocritical, noting the bombing campaign in Cambodia during the Vietnam War. Reported for RFA's Khmer Service by Moniroth Morm. Translated by Sovannarith Keo and Sarada Taing. Written in English by Brooks Boliek. hun sen, mass murder who should be tried for crimes against humanity lives on and will be elected due to intimidation at the ballot box, a vote for me or a bullet, he has done it before and will again, my deepest regret is as an australian tax payer why does our govenment give our money so freely to this despot,things will be same, same in cambodia as he will use the army to crush any apponents that stand in his way. You cannot take wealth with you when you die, you will be tortured in hell forever ! We will pray for you, for prayers work, and prove that God exists. That is why Cambodia has never had a true democratic election. You can keep your wealth and live peacefully with your family. If I were you, I would make a plan to leave the power for those who are thirsty to make change for good for the poor Cambodian people. No one will go after you if you arrange thing properly. It is time for change as you do not the capability to lead the country any more. People are fed up with you!!! If the king loves and care about his people and seek true democracy on his own land he should not sign the "culprit law). I do not brainwash my people like North Korea. If I do not strive to win every election to gain power, where do I live since my wealth has been accumulated over the past 30 years. Sorry I have to win every time. Tell me where to go with this much amount of wealth.